Reflex Packages are another way to group your characters settings. What makes packages different from groups? You can export packages to share with other characters and friends. 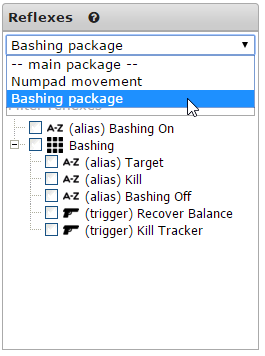 For example, you may create a package of triggers and aliases used for bashing mobs in the game. You can then export these settings to share. The following steps detail how to create, edit, export, and import reflex packages. The first step to using the reflex package system is to create a new package. You can then copy reflexes into the new package. Creating a new package is very simple. The following steps will walk you through the process of creating a new package. Keep in mind it will not add reflexes to it, you must do that separately. Click the 'Reflex Packages' tab in the settings window and then click the 'Add a package' button. Decide on a package name and description then click 'Save'. 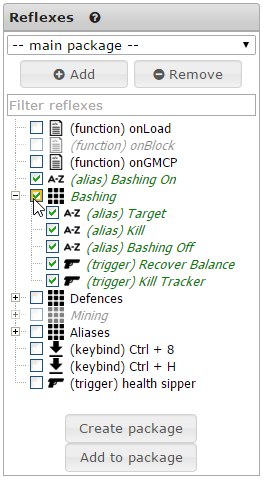 In the example below, we are creating a new package called 'mining'. 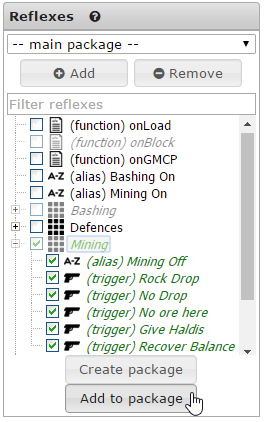 Once you confirm, the package is automatically displayed in the reflex package list. Below you can see that the 'Mining' package has been added to the list. Now that you have a package, you will want to add reflexes to it. Note that it will NOT delete the existing reflex. It will make a copy of the reflex and then add it to the package you select. You will then have two copies of the reflex. Note: The original reflex is not deleted. A copy is made in the selected package. This describes how to edit the name or description of your package to something more informative. Editing reflexes in a package is as simple as editing any other reflex. Click on the 'Reflexes' tab. Select the package you want to view and edit. You can download a package in order to save it as a backup, use with other characters, or share with your friends. To download a package, just click on the small disk icon on the Reflex Packages tab. Note that the file is saved as a .nxs file. This is short for 'Nexus'. You can also alternatively export specific settings to a .nxs file in three easy steps. This will 'not create a new package' on your system. To begin click the check marks next to the settings you wish to have in the package. 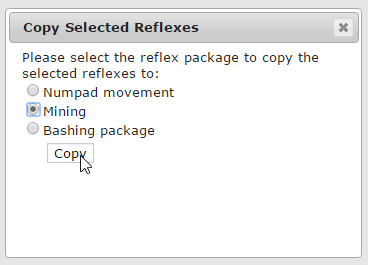 Once you have checked everything, click the 'Create package' button located beneath the list of reflexes. You will then have a popup window in your browser that will allow you to name your package and confirm that you are done by clicking 'OK'. Your browser will automatically download this package after you click 'OK'. In Chrome, it will appear at the bottom of the browser. This may be different depending on your operating system and browser. Importing a package is a drag and drop, one step process. 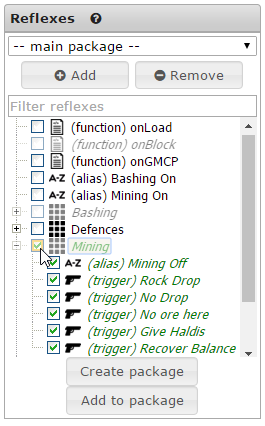 Simply click the 'Reflex Packages' tab and drag the .nxs file to the 'Import Reflex Package' area. These reflexes will now work automatically with your client. Notice that once you have done this, the package will be listed in the 'Reflex Packages' section. This page was last modified on 16 September 2016, at 18:46.